Excellent, owner-occupied, five or six bedroom, two bathroom family home in super location very close to Van Bien Elementary School. It is located on a large pie-shaped lot on a quiet street with a large double carport and with very good RV parking and backyard access for vehicles. This home has been very well cared for with newer roof shingles, newer deck, and newer vinyl siding. Master bedroom has walk-in closet, and bathroom comes with jacuzzi tub. Also has a large storage shed/wired workshop in spacious backyard. 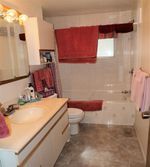 Fully finished basement has good inlaw suite potential or would make a great day care with an elementary school only a couple of hundred meters away.